The waxwork museum, Madame Tussaud's, was opened in its current location in 1884. 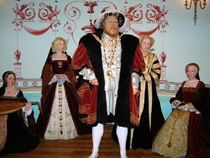 As one of London's most popular attractions, it features waxworks of many of the world's most prominent and famous figures. Millions of people have flocked through the doors of Madame Tussaud's since it first opened. There are many reasons for this enduring success, but at the heart of it all is good, old-fashioned curiosity. Today’s visitors are sent on a unique, emotionally-charged journey through the realms of the powerful and famous. The museum-style ropes and poles have gone so guests can truly get up close and personal with A-list celebrities, sporting legends, political heavyweights and historical icons, reliving the times, events and moments that made the world talk about them. Meet your favourite celebrity, be snapped alongside the stars and score a goal with the England football team. There's plenty to do and see at Madame Tussaud's.